The slab saw is the most commonly used method to efficiently aid the removal and alteration of concrete. Slab sawing employs the use of a motor mounted on a rigid frame that is self-propelled and requires only one technician to operate. Also referred to as a flat saw, the slab saw is used to cut horizontal flat surfaces such as floors, bridge decks, and pavement. Various power options including gas, diesel and electric, allow use of the slab saw in most any location. Gas and Diesel are the most common options used for applications outside. Electric options are available for indoor fume free service. When combined with our self-contained service truck as a power source, the electric saw can be used at any location. Utilizing wet-cut diamond blades up to 66" diameter, the slab saw is capable of cutting dust-free 30" deep. 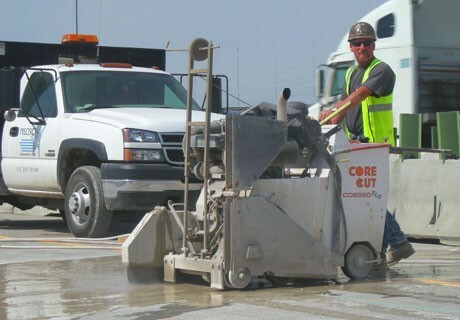 Slab sawing is a cost effective, and time saving choice when used to provide sawing for expansion joints, removal of damaged pavement sections, to clean and repair random cracks for repair, and isolation of slabs to remove concrete sections for demolition purposes.